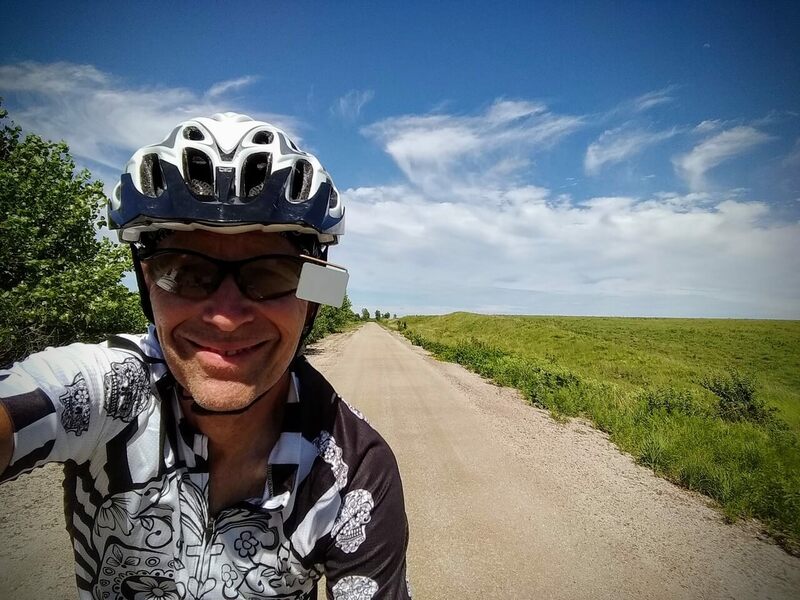 I’m back home from a short 4-day 3-night tour on the Prairie Spirit Trail (PST) and the Flint Hills Nature Trail (FHNT). 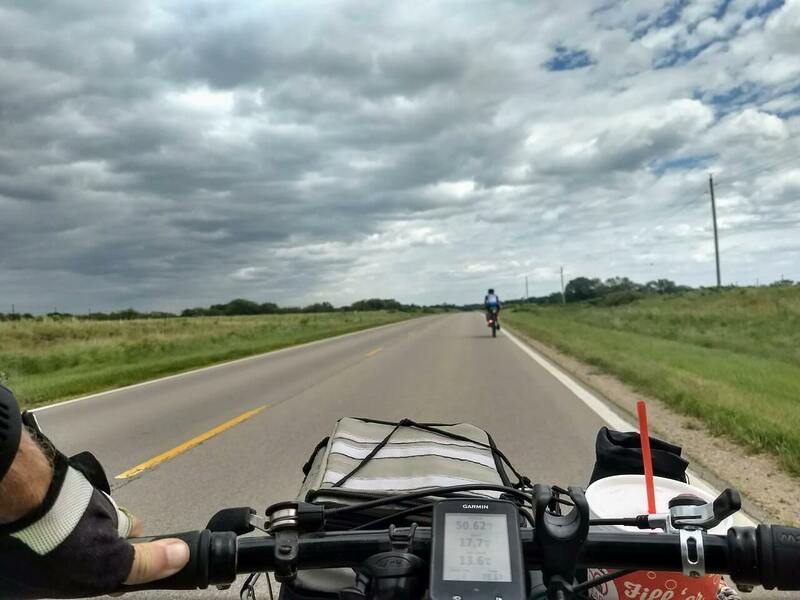 Here’s the route, followed by a narrative, and a bunch of photos! 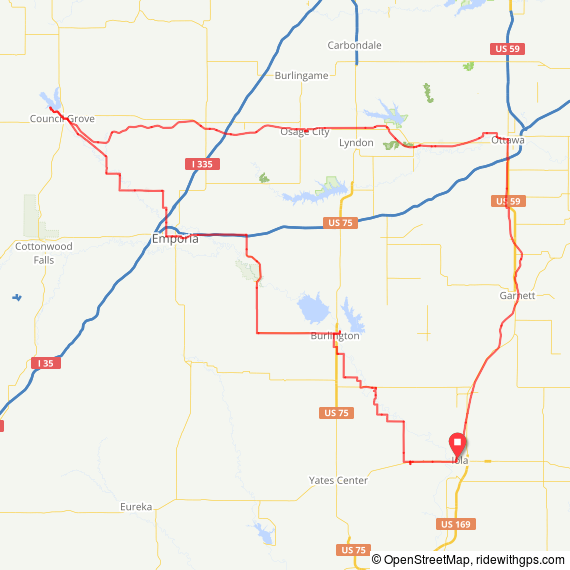 Three of us (myself, Kimberly, and Jay) took off from Iola Tuesday morning, and rode the PST north to Ottawa, pausing in Garnett for lunch. We had a nice tailwind, and so it was a fairly easy ride. 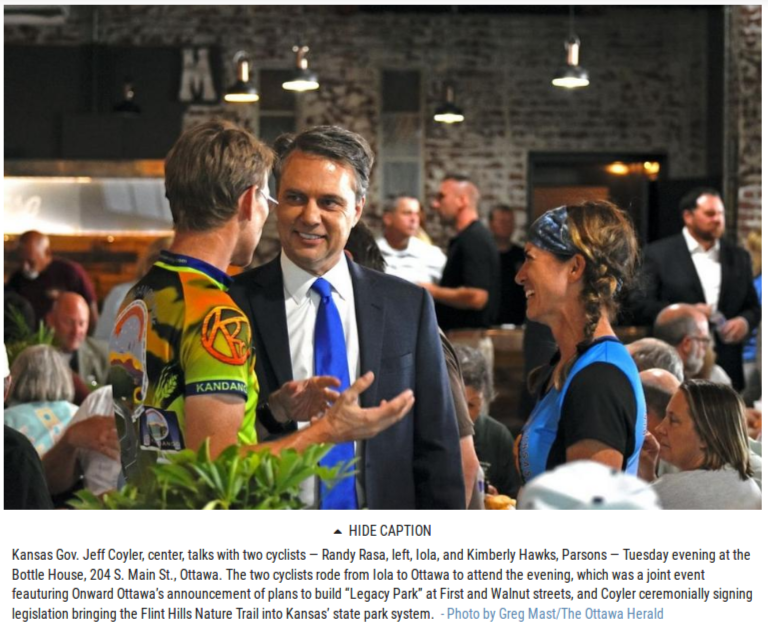 In Ottawa, we ate and early dinner, then attended a community event that included a ceremonial signing of the bill designating the FHNT as a Kansas State Park. The event also presented Ottawa’s concept for an outdoor event space at the intersection of the PST and FHNT, called Legacy Square. Very impressive! 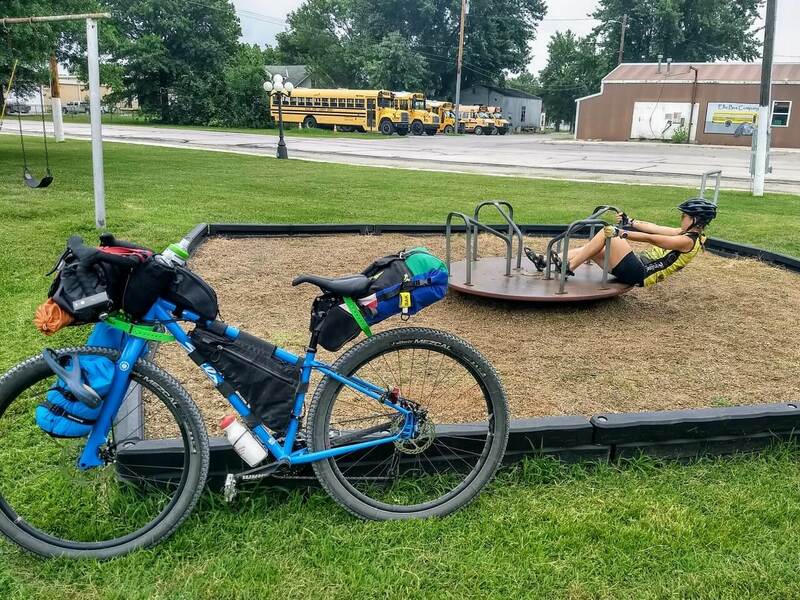 The next morning started with breakfast at the Lamont Hill Restaurant, followed by 13 miles or so to Osage City. 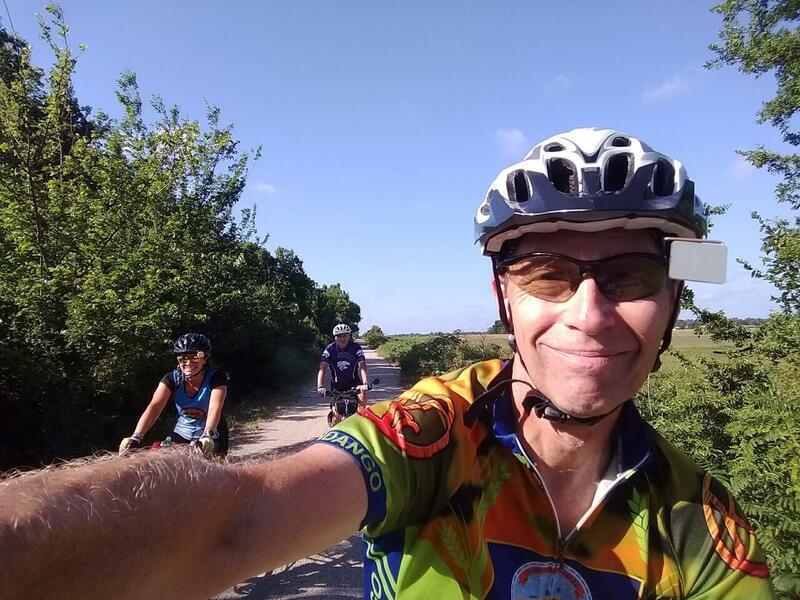 Jay split off from us to ride solo to Topeka, so it was just me, Kimberly and Doug. The FHNT east of Osage City had some soft spots, but no goathead thorns, thankfully. After restocking with food and drink in town, we headed west on the FHNT. The section between Osage City and Admire is roughest part of the trail, currently. It’s been mowed, and sprayed, but the original railroad ballast is still in place in some sections, and some bridges are unimproved. As I understand it, this part of the trail between Vassar (Pomona State Park) and Admire is next on the schedule for improvements. I wasn’t happy with my tire choice. I was running 700×35 Schwalbe Marathon XR’s. They have a reputation for ruggedness, but it comes at the cost of a harsh slow ride. 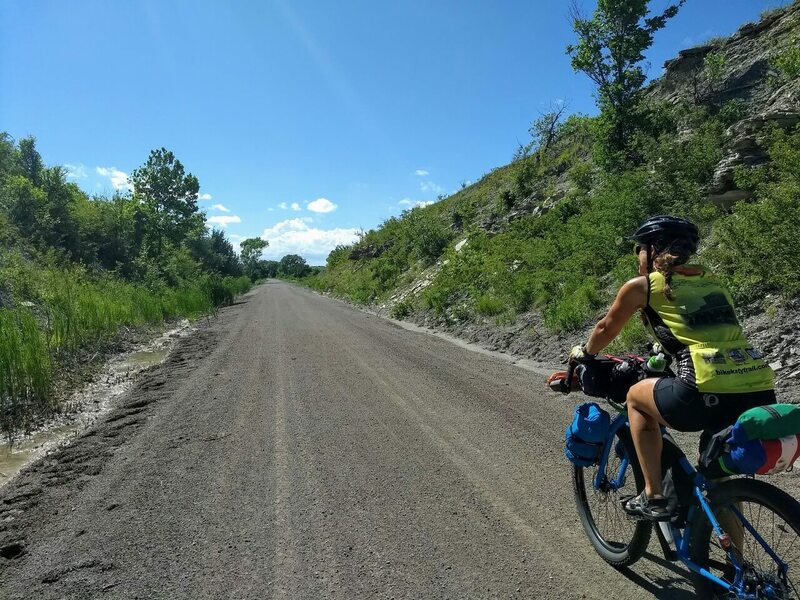 With the rough surface of the FHNT, and even some gravel roads, it was beating me up pretty bad. I still like my front basket! Being able to carry a cold drink in a styrofoam cup is so nice. 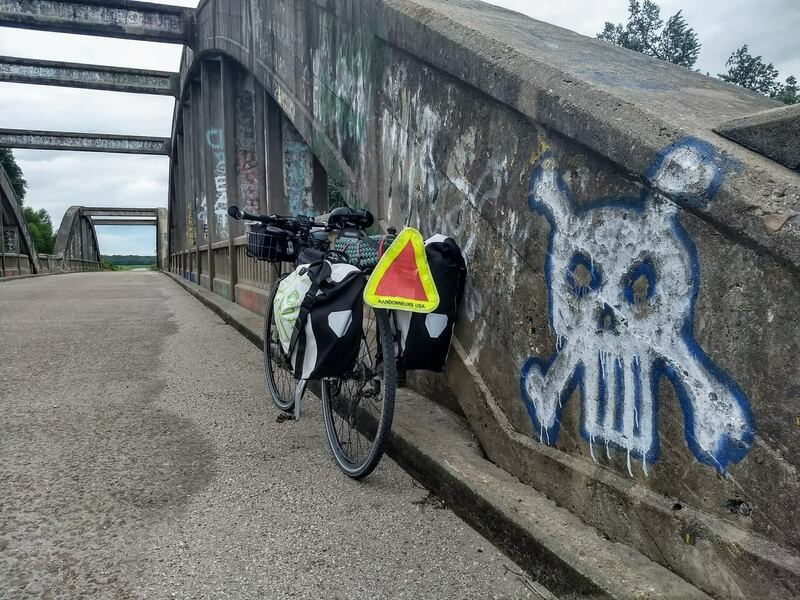 Not sure if it was the poor tires, or the bike in general, but this was the first tour where I wasn’t happy with the Retrospec Amok as a touring bike. Thinking about a more bikepacking-oriented rig for future off-road tours. Bigger/better tires for sure. If I go with a bikepacking-style setup, I’ll probably have to swap my Z-Rest foam sleeping pad for an inflatable pad, just for pack volume. I’m comfortable with the foam pad, but it takes up so much space! All of my other gear and clothing choices worked great, as usual. 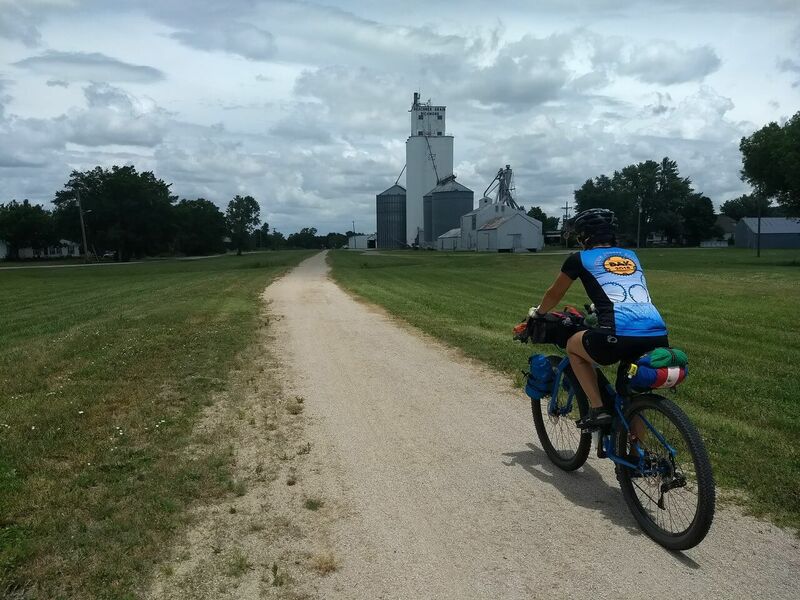 Bicycle touring on the Prairie Spirit Trail with Kimberly and Jay. On the Prairie Spirit Trail in Richmond. Crossing a short bridge on the Prairie Spirit Trail near Ottawa. Riding the center bike lanes on the Prairie Spirit Trail in Ottawa. 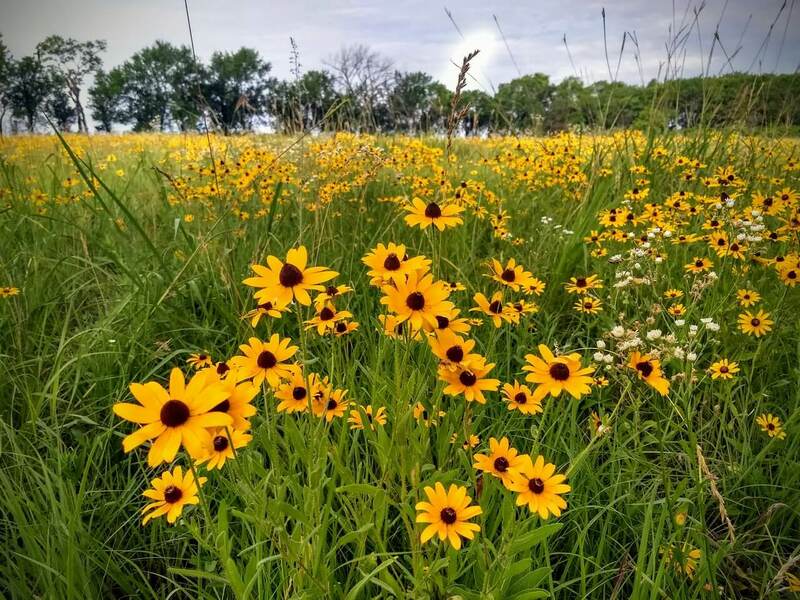 A lush meadow of Black-Eyed Susan along the Flint Hills Nature Trail. 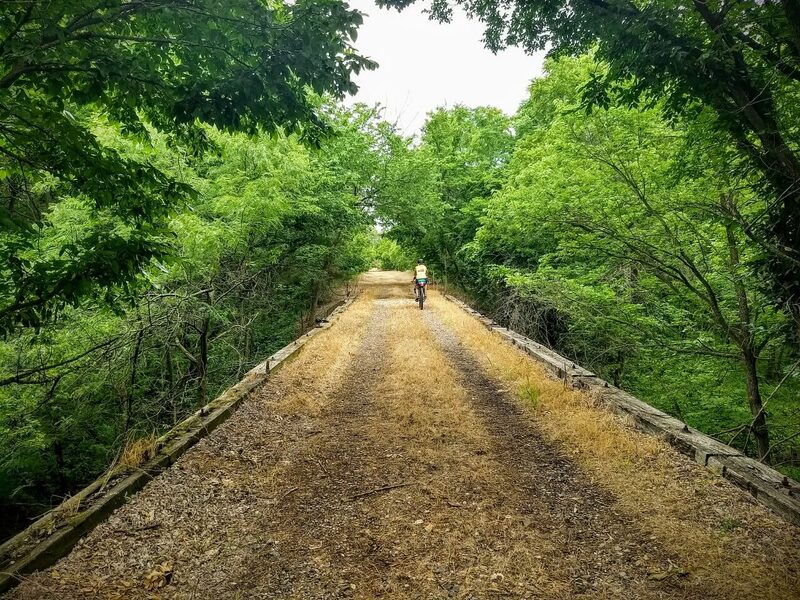 Crossing an unimproved bridge on the Flint Hills Nature Trail near Osage City. 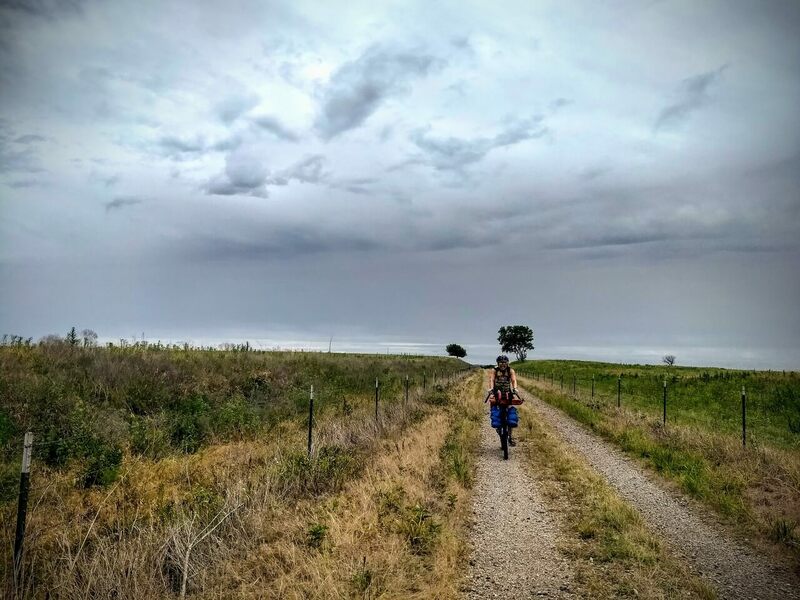 Crossing the open prairie on the Flint Hills Nature Trail. 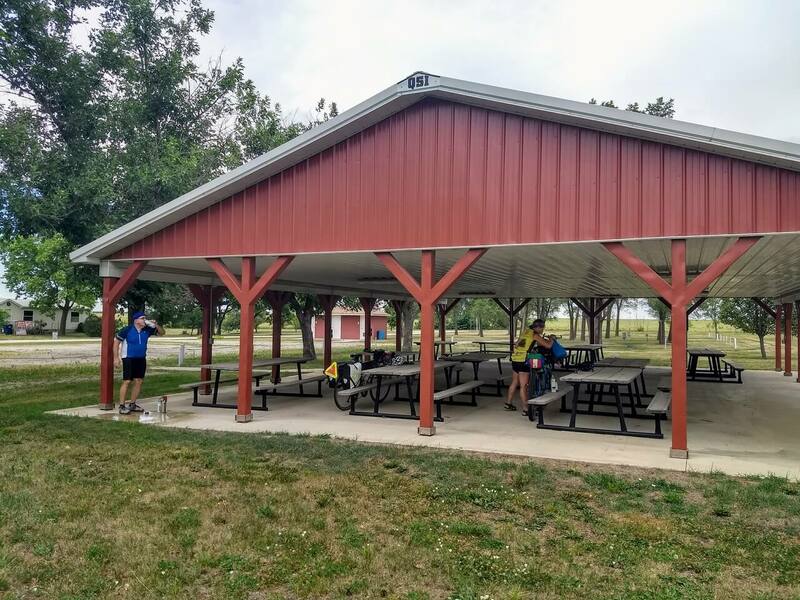 The city of Admire has a very nice shelter house near the trail. Water, electricity, restrooms, free camping! 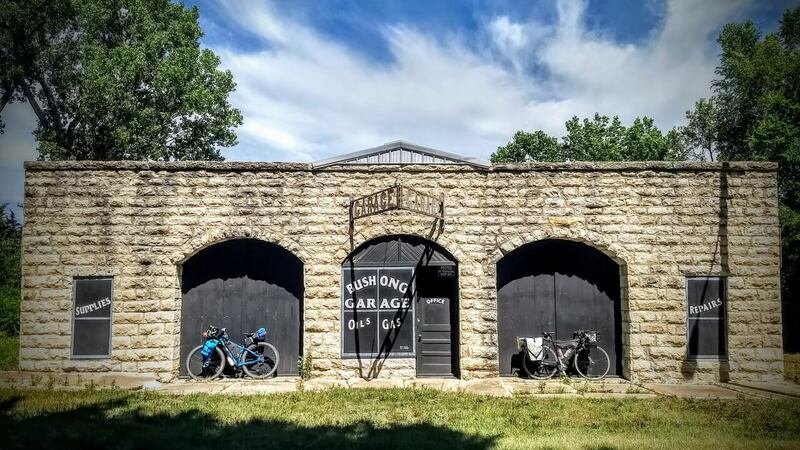 An old garage in Bushong. 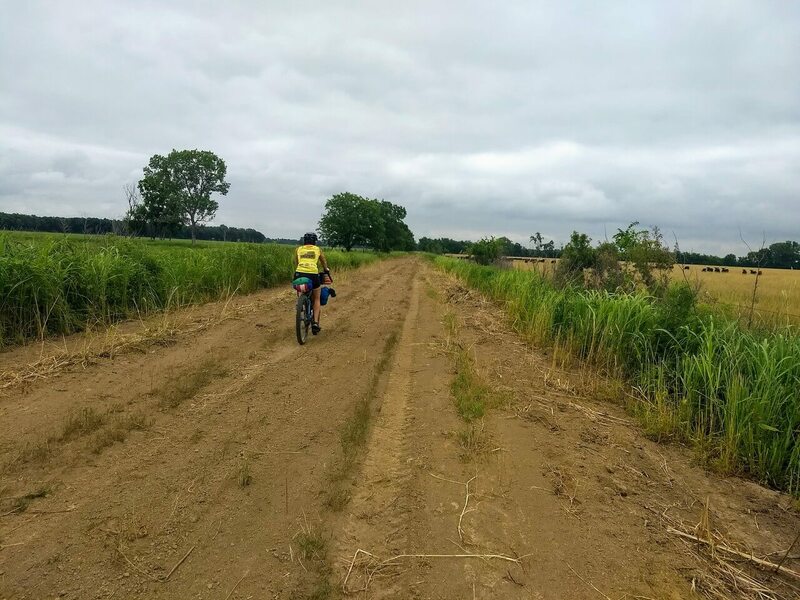 The Flint Hills Nature Trail passes through a number of cuts as it makes its way west through the hills. A panoramic view of the countryside along the the Flint Hills Nature Trail west of Bushong. Breathtaking! 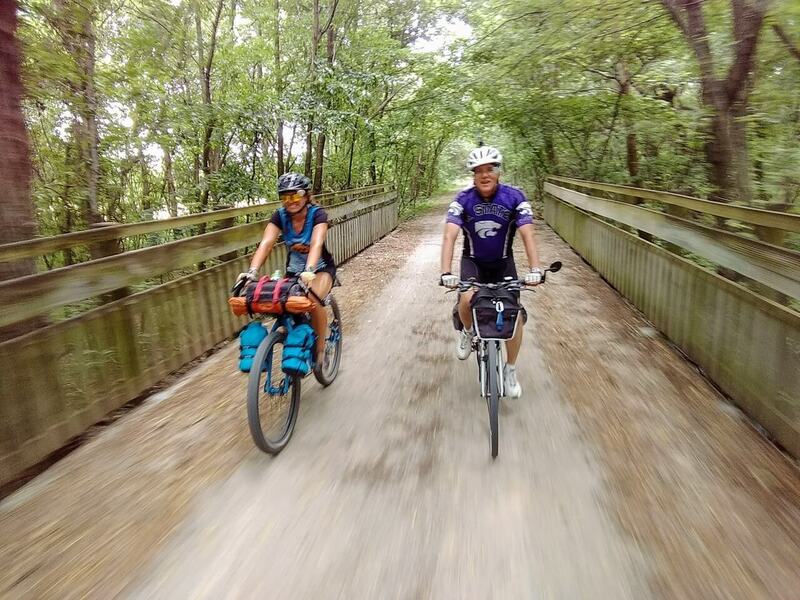 It’s hard not to smile when riding the the Flint Hills Nature Trail. 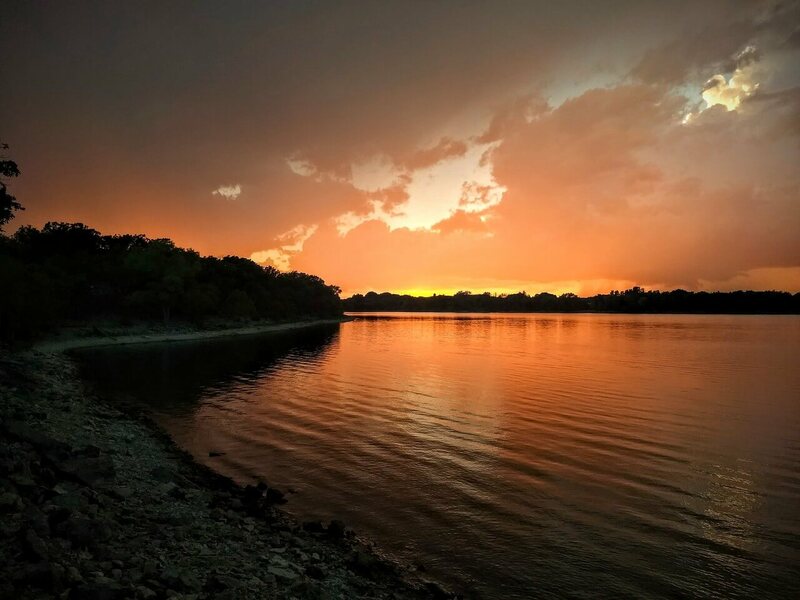 A lovely sunset at Council Grove Lake. 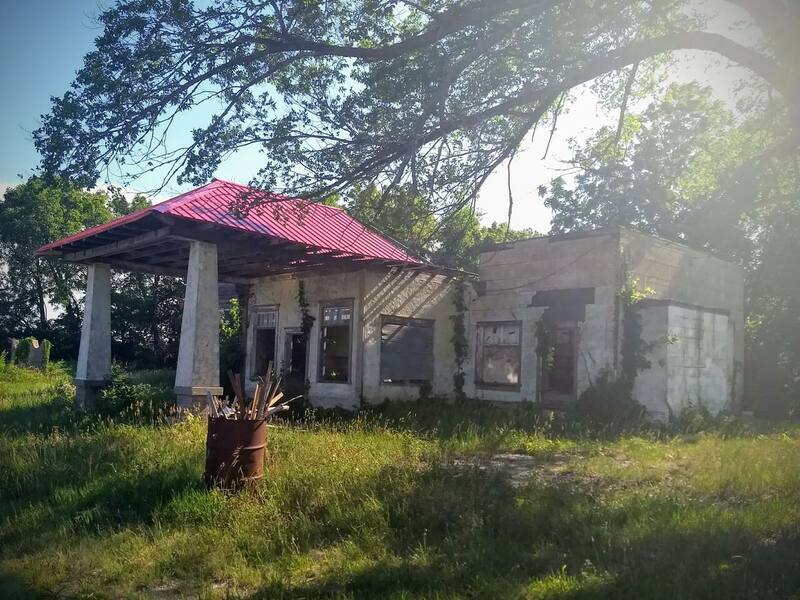 An old service station in Dunlap. It has a good roof, at least! Cruising along at 17 MPH thanks to a strong tailwind. Sweet! A grafitti-covered Rainbow Bridge in Hartford. 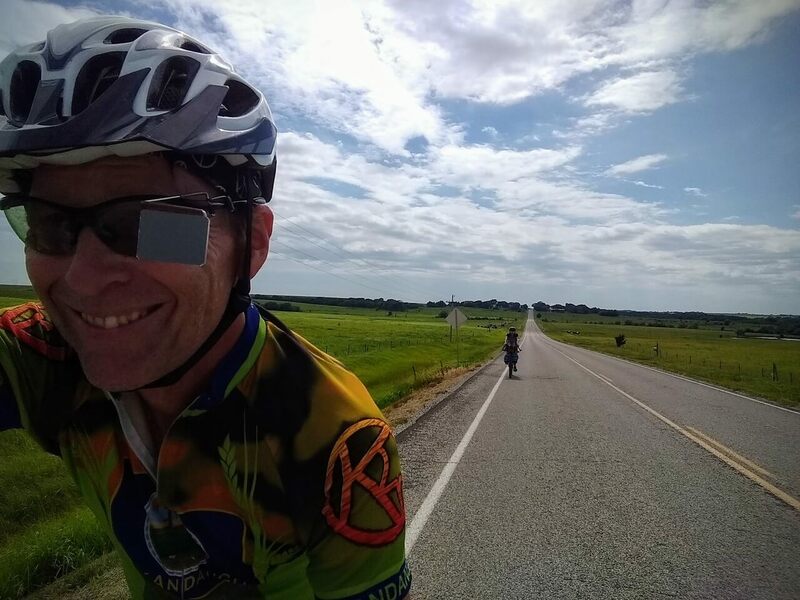 More smiles as we roll through the countryside near Burlington. 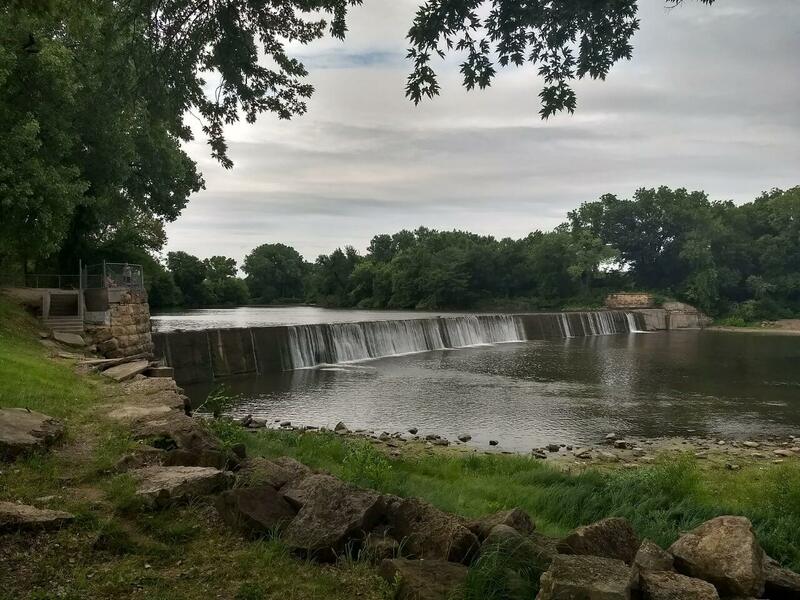 Burlington’s Drake Park offers a beautiful campsite along the Neosho River. Riding small-town merry-go-rounds is Kimberly’s thing. Also, check out this view of her bikepacking setup. A minimum maintenance road between Leroy and Neosho Falls. Randy – this is a great blog! Thanks for joining us at the celebration event. It was great to have folks there in bike gear! 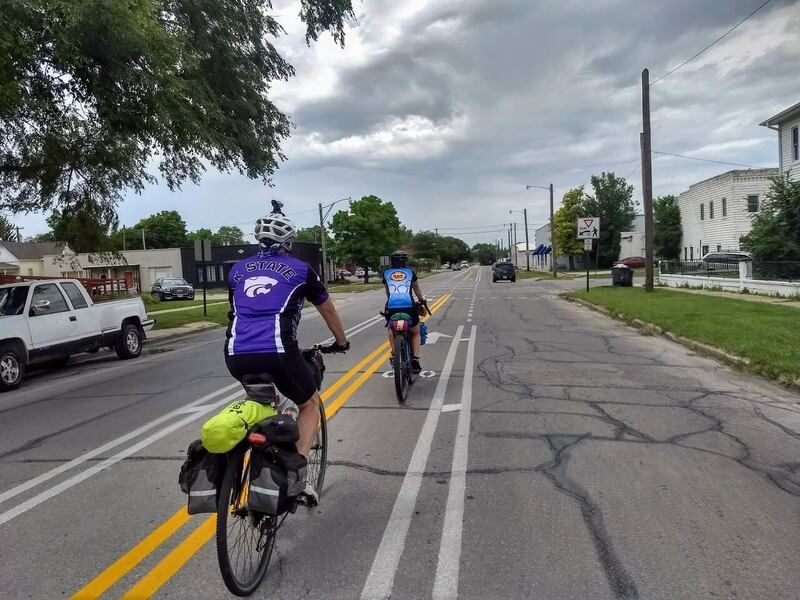 And you are right….the stretch from Admire to Osage City is next in line for upgrades…we’ll start construction this area in October. Thanks for sharing your adventure!